The five arrested include three Vale employees and two engineers, who recently attested to the dam's stability. RIO DE JANEIRO, BRAZIL – Three Vale employees responsible for the licensing of the dam that broke in Brumadinho and two engineers from a partner company, who attested recently to the stability of the project were arrested on Monday. Mining giant, Vale, says it will cooperate fully with authorities. 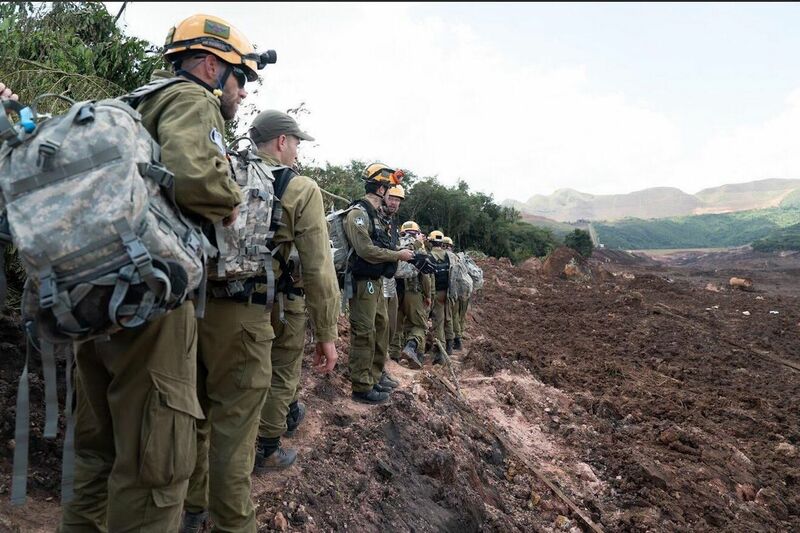 Rescuers are in their fifth day of looking for at least 288 people missing after the dam burst in Brumadinho, photo courtesy of Israel Defense Forces. “With regards to the warrants served this morning, Vale informs that it is fully cooperating with the authorities. Vale will continue to support the investigations in order to determine the facts, in addition to the unconditional support to the families,” read the statement issued by Vale on Tuesday morning. The Public Prosecutor’s Office of Minas Gerais (MPMG), the Federal Public Prosecutor’s Office (MPF) and the Federal Police (PF) also served seven search and seizure warrants in order to establish criminal responsibility for disaster caused by the breaking of the mining dam in Minas Gerais. According to prosecutors the two engineers TÜV SÜD company, arrested in São Paulo, are suspected of defrauding Vale’s technical reports, allowing operations at the Feijão Mine dam in Brumadinho to continue. A recent report signed by the two attested to the dam’s stability. The arrest warrants are valid for a period of 30 days and all five will be heard by prosecutors in Minas Gerais. The documents and evidence seized will also be sent to the Public Ministry for analysis. In addition to the actions taken by the Minas Gerais state government, the federal government published on Tuesday a resolution that determines the immediate evaluation of all the dams in the country. The determination is that priority be given to a list of dams classified as having ‘high potential damage’ or ‘high risk’ of breaking. As of midday on Tuesday, 65 people were confirmed dead and 288 were still missing.